Left as a baby at a monastery, fifteen-year-old Tristan lives a quiet life among the monks without a clue as to his past except for the blue woolen blanket he was left in. Still, he spends his days in relative tranquility, learning to read and write, and helping with the chores. His life is disrupted when a group of the Knights Templar arrive at the monastery, and Tristan is invited to come along with them as a squire to Sir Thomas–one of the most popular and brave knights. With some trepidation, Tristan accepts–and is thrust into a dangerous journey to the Middle East, which becomes more perilous when Tristan is entrusted with the Holy Grail. 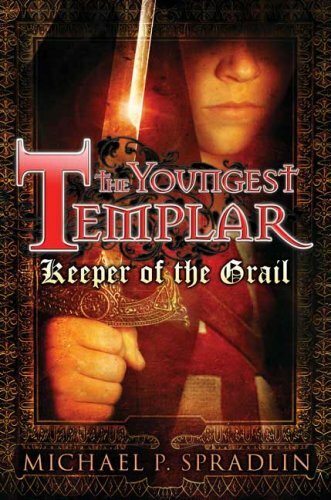 Not only must he make sure the Grail is safely returned to England, but he comes to realize that there are those who know his true identity–and they do not want him to find out who he really is. The characters in this book really make it work. Tristan is brave and bold, but plagued with self-doubt and a lack of self-knowledge. The knights are often larger-than-life, and I was excited to see the characters of Robard Hode (Robin Hood) and Maryam (destined to become Maid Marion later on) make an appearance. I think the character of Robard is particularly well-done, and I love the portrayal of Maryam as an assassin warrior who likes to put him in his place. The writing is fast-paced, and this story is a good next step for those readers who have enjoyed Jon Scieszka’s Time Warp Trio series and are ready to move up. There is a fair amount of violence in the book, from descriptions of battle to a jealous Knight attacking Tristan, so I would be mindful of giving this book to younger readers. I do want to note that there is a lot of terminology that may throw younger readers off, which is why I would recommend pairing this book with a history of the Crusades. If you can find it at a library, the DK Eyewitness: Crusades provides a good overview (alas, it is out of print!). Personally, I recommend Janet Harvey Kelman’s Stories from the Crusades, and King Richard the Lionhearted and the Crusades in World History by Katherine and Craig Doherty. If nothing else, a viewing of Indiana Jones and the Last Crusade might be in order! Questions about Islam and the Muslim involvement in the crusades might arise as well; I would check out the DK Eyewitness: Islam for those. It provides a nice overview for that age group. Just as a warning–this book ends on a definite cliffhanger! The second installment, Trail of Fate, is not due out until September of this year, so we will have to see what awaits Tristan.